Approximately 2 tonnes of trash (including a motorbike, a Christmas tree, a/c’s, pots, a children’s trolley, etc.) 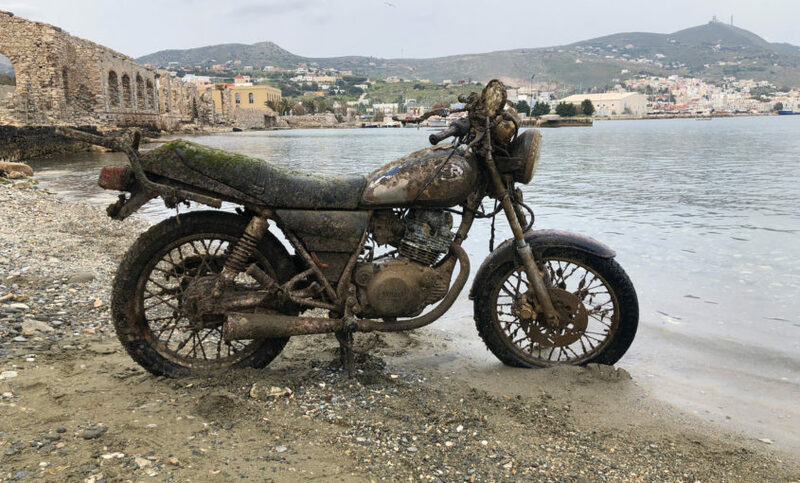 were removed from Ladopoulos beach in Syros island, where beach and underwater cleanup took place under the coordination of the organisation “All For Blue” by Katerina Topouzoglou and the Region of South Aegean. “KeepAegeanBlue” is the biggest mission for educational programs, beach & underwater cleanups in Greece, the team travels the Aegean islands with a motor boat in order to educate the new generation about ocean conservation. 200 students of the Professional Lyceum (EPAL) of Syros and the Unified Special High School of High School (SYNEY) of Syros participated in the beach cleanup, while in the underwater cleanup there were professional divers from “All For Blue, as well as volunteer divers from the diving center of Antonis Printezis, ScubaGreece. The trash was removed with the help of Syros municipality. An ocean conservation seminar, hosted in the “Constantinos Toulipis” Multiple Use Hall of the Lyceum School, was held as usual before the action. In the amphitheater, Katerina Topouzoglou spoke to the students of the two schools about the importance of protecting the sea and ways of protecting marine animals, avoiding disposable plastics and the myth of biodegradable plastics. The program of the actions of the “Keep Aegean Blue” initiative, undertaken by the South Aegean Region and implemented in co-operation with “All For Blue”, continues, followed by Andros (16 April), Tinos (17 April) Mykonos (18 April) and Karpathos (May 8).